I have to say up front that I am not a "holiday teacher". In general, I just let holidays slide right past with nary a mention. It isn't that I am anti-holiday, but usually I just have so much to do with my students to get everything in, that stopping to take time out for a craft or whatnot is just not on my radar. That is, until I find something that can cover my standards bases AND be holiday related. Luckily, that does happen every so often -- much to the enjoyment of my students. They do like discussing the holidays and I am happy when I can find an activity or unit that will fill that little holiday nook. December especially is filled with so many holidays, that if I can do something fun and rigorous with them, it becomes a win-win for everyone. Here are a few of my tried and true activities that are always a hit AND pack an academic punch. The weeks leading up to winter break is the perfect time to work on literary devices/figurative language and a poetry unit. The kids aren't really in the "mood" for anything super heavy since there is practice for the holiday show, wrapping up on other units before break time, and generally a feeling of excitement that Christmas and Hanukkah are around the corner. They just want to relax and have fun, yet I need them to be learning at the same time. Poetry is the best for that! I take this time to teach about personification, alliteration, onomatopoeia, hyperbole, simile, and metaphor. We talk about the different literary devices, brainstorm ideas together and they write their own examples. Since we usually are talking about holidays at this time, I have them write their ideas all within the same topic of "Christmas". The topic is rather open, and they can write about what they see around them, their feelings, even what they want as gifts! They always have so much fun writing about that! I love this little project. 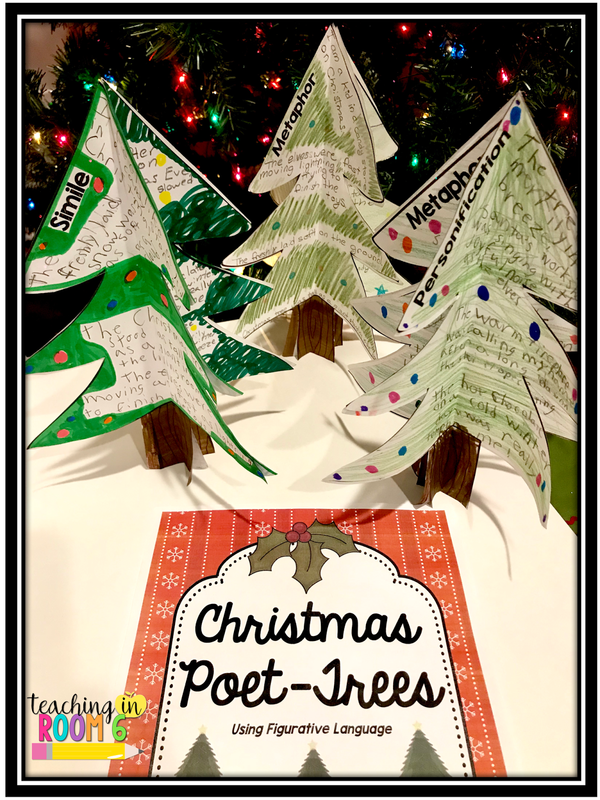 I wrote about it in great detail here, but basically, the student create beautiful trees out of tissue paper. They then measure the triangles that form the trees (in the linked post, they measured using a protractor, but you can do metric measures, customary measures, perimeter, area...whatever your particular standards call for), do some math associated with the trees. 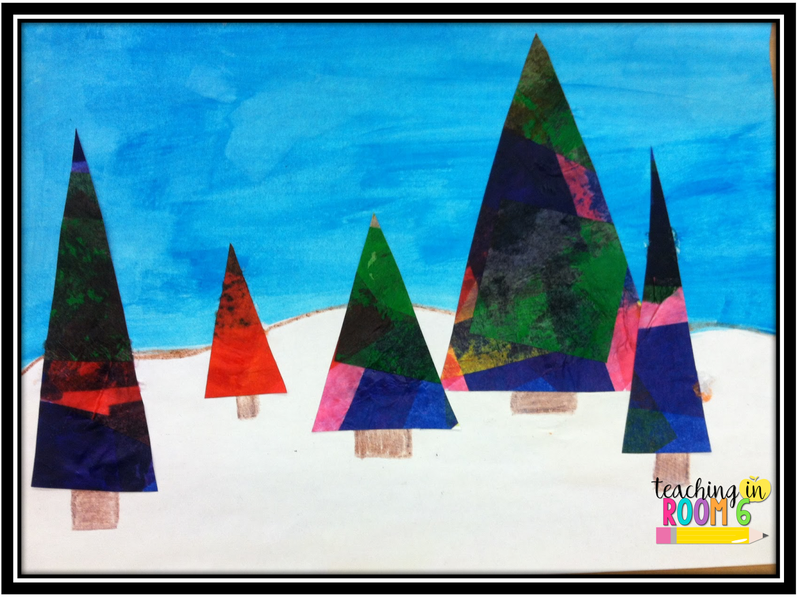 The little trees can be displayed to look like they are in a snowy forest using water color. Honestly, they look amazing on the board, even into January! This one is simple and fun. 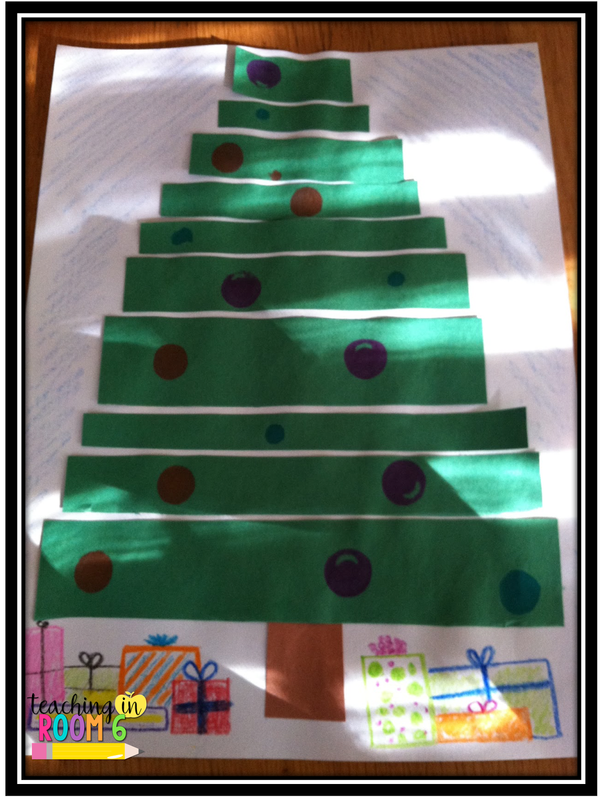 The kids cut strips of paper in varying lengths to mimic the branches with leaves of a Christmas tree. They need to be various lengths and widths to complete the tree. After the students construct the tree, they measure the "branches" using the centimeter rule. They then find the area and perimeter of each branch. Simple, to the point, and right within our standards. Click here to get the recording sheet. What projects have you done to keep within the standards, yet still have some holiday fun? Hey Stephanie! You found a ton of great ideas--thanks for sharing! We are going to be swamped with assessments and report cards, so I am grateful for you sharing your finds. This time always comes up so suddenly, doesn't it? This time of year happens all too fast. I think I have a long time to plan and get it all done and then...we are locking up for break. Crazy how time speeds up this time of year. I love the integration of something fun and creative that allows the kids to apply their math skills. We're not starting geometry for a bit, but you're giving me some ideas for when we do-thanks! Hey girl! Love the new blog layout! 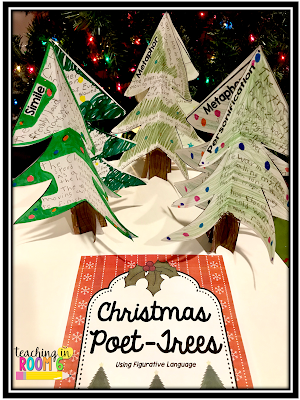 I love the "poet-trees"... I just might have to make those in my 3rd grade room. Hi Lindsay! Haven't seen you in a while :) Thanks! Kristen did the design and I love it too!